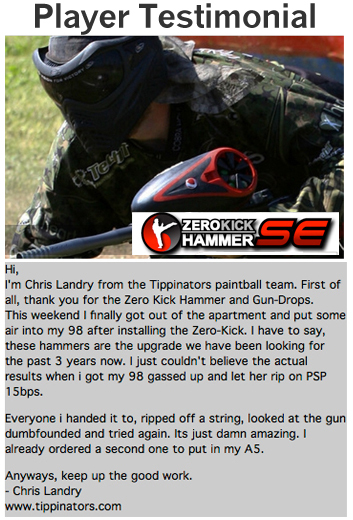 The Zero Kick Hammer SE™ is the most important/noticeable performance upgrade you can install on your paintball marker. 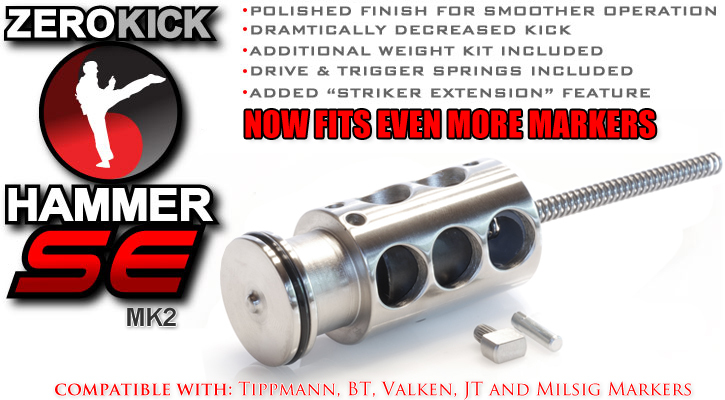 Zero Kick Hammer Mk2 design weighs in at nearly half the weight of the stock hammer in order to reduce kick and recoil. The less weight you have slamming back and forth, means the less the gun moves with each shot. The result is increased accuracy! To even further increase accuracy we also hand polish the outer bore of the hammer to allow it to move as freely as possible inside the gun. This makes for better consistency and that equates to even further increased accuracy. We also increased the wear life of the hammer by heat treating the hammer to be 20% harder than the stock hammer. This means that no matter how much you use and abuse it, it will continue to work as intended! All in all, the Zero Kick Hammer is designed to dramatically improve the overall firing characteristics, feel, reliability and accuracy of your marker. 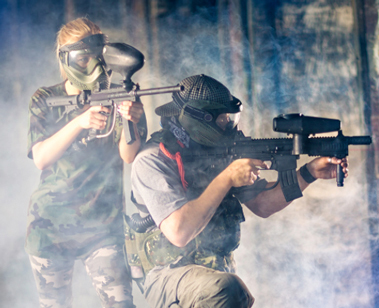 Tippmann Valve Spring allows you to get more velocity when you need it. This may work in both 98, A5, and X7 Tippmann Markers but you will need to ensure that your stock valve spring length is approx. .75 inches in length. High Velocity Lightened Valve Spring Upgrade for Tippmann A5, X7, and 98's and similar is what you need to get if you want or need more velocity from your marker. This spring is approx. 1" in length. Ensure yours is the same before buying. 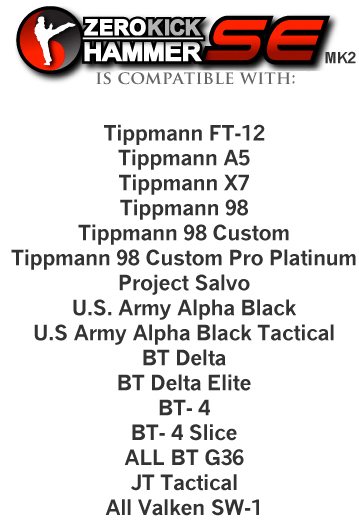 This kit is what you need for all Tippmann 98, A5, X7, Alpha Black and all the newer models of Tippmanns. This is the drive spring you will need for the Zero Kick Hammer. One comes with the hammer, but its a good idea to have an extra.